The independently owned River Cruise Line was founded in 2001 and is based in Market Harborough, Leicestershire. It specialises in river cruises for the U.K. market and boasts a high level of repeat business. Its sister company is Diamond Shortbreak Holidays, which sells coach tours. In March 2017, The River Cruise Line's parent company Diamond Shortbreak Holidays Ltd. ceased trading. The 190-passenger ms Serenity is the four-star "leading lady" in the fleet exclusively chartered by the U.K.-based River Cruise Line. 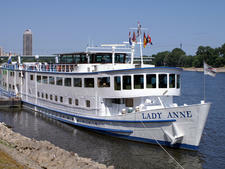 Lady Anne is the oldest ship on the Rhine. Originally built as a barge in 1903 the heritage vessel is chartered by U.K's River Cruise Line. The U.K.-based River Cruise Line specialises in affordable cruises throughout Europe. The fleet of chartered vessels includes the oldest ship sailing on the Rhine River, a two-deck converted barge and a pair of five-deck vessels that cruise the Russian waterways. The line also offers a coastal voyage to the Baltic Isles on a 102-passenger ship. Attracting mainly retired folk, the cruise line's central European itineraries all include escorted coach travel from British pickup points and Channel crossings by ferry or Eurostar. Passengers also have the option to pay a supplement to travel by rail or air, or receive a discount if they opt to make their own travel arrangements. The cost of sailings in Russia and the Baltics includes flights. An experienced cruise director and a cruise manager accompanies all cruises. The majority of itineraries are based on the Rhine, Main and Danube aboard chartered vessels where the focus is on comfort rather than luxury. Lady Anne, described by many passengers as a "floating home from home," is the oldest ship to sail on the Rhine and dates to 1903. Days begin with tea and coffee for early risers, served in the lounge. Hearty, home-style meals cater to British tastes, and the breakfast buffet always includes all the components for a "full English," along with juices, cereal, yoghurt, toast and pastries. Lunch, also buffet-style, features salads, cold cuts and a hot dish, such as fish and chips. The served four-course evening meals are likely to include staples like roast beef, and rack of lamb with mint sauce. Vegetarian and special diets can be catered for with advance notice. Complimentary coffee and biscuits are served each morning, and water, tea and coffee are included with lunch and dinner. All other drinks, which are very reasonably priced, can be purchased from the bar or in the dining room and passengers are welcome to bring their own drinks onboard to enjoy in their cabin. Daily excursions, usually a combination of a coach trip and a gentle walking tour, are not included in the price of the cruise. They can be booked in advance, for a small discount, or onboard. The vessels are not suitable for wheelchair passengers, although foldable wheelchairs and other mobility devices for excursions can be stored on coaches with advance notice. Passengers are asked to discuss any mobility issues at the time of booking to ensure the itinerary is suitable for their needs. Smoking (including the use of electronic cigarettes) is not allowed onboard. There are designated smoking areas on the ships' sun decks. Each ship has a resident musical entertainer, usually in the form of a singer or a keyboard player. Other entertainment varies day to day, but includes activities like bingo, quizzes, sing-a-longs and dancing and there is a captain's gala night on each cruise. Tipping is discretionary, with a recommended €5 per passenger, per day charge, which is shared equally between crew members. This does not include the cruise director, cruise manager or coach driver, who can be tipped separately. Designed with the U.K. cruiser in mind, the River Cruise Line attracts mature passengers, mainly over 60 and the majority are retired. Many are repeat customers who have been loyal to the company for years. The line is very popular with groups, and ships like Lady Anne can be chartered by clubs and organisations for special interest trips. Solo travellers are also catered for with no single supplements on selected sailings. Editor's Note: In March 2017, The River Cruise Line's parent company Diamond Shortbreak Holidays Ltd. ceased trading and all future cruise bookings were cancelled. At the time of writing it is unclear what will happen to the line's two ships. The River Cruise Line operates a fleet of six chartered vessels. Lady Anne was built as a barge in 1903 and converted to a 100-passenger vessel in 1963. In line with its heritage, the 230-foot ship has a traditional, cosy atmosphere and a loyal following. Built in 2006, the 184-passenger Serenity has cabins with French balconies on the upper deck. Sailing on European waterways, it offers a choice of itineraries ranging from spring garden tours in Holland and Belgium to a 15-night sailing through seven countries. Princess sails along the Elbe to the Baltic Sea. Launched in 1980 and refurbished in 2010, it carries 102 passengers. 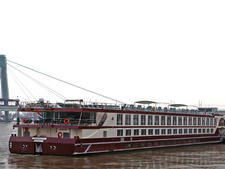 The River Cruise Line also charters two vessels in Russia. With room for 296 passengers, the five-deck ms Z Shashkov was built in 1986 and refurbished in 2011. It includes two suites, with a separate lounge and bedroom that can accommodate up to three people. The near identical sister ship, ms Russ, was launched in 1987 and renovated in 2007. The smallest ship in the fleet is the African Queen, which accommodates 14 passengers and is one of only a handful of floating hotels that sail along the River Thames. Its current owners converted the Dutch barge into a passenger ship in 2004. The River Cruise Line offers a recently expanded collection of 30 itineraries to 16 countries throughout Europe, including Russia and the Baltics; they range from four to 15 days. The Rhine and Danube are the mainstay of the cruise programme. Popular voyages include the five-day Rhine Discovery, from Koblenz to Cologne, and four-day seasonal cruises to the Dutch bulb fields and German Christmas markets. The longest itinerary, the Danube to the Black Sea, travels through Germany, Austria, Slovakia, Hungary, Serbia, Bulgaria and Romania. Customers can book cruises direct with the River Cruise Line or through a travel agent.